Breathe in the fresh air of spring! 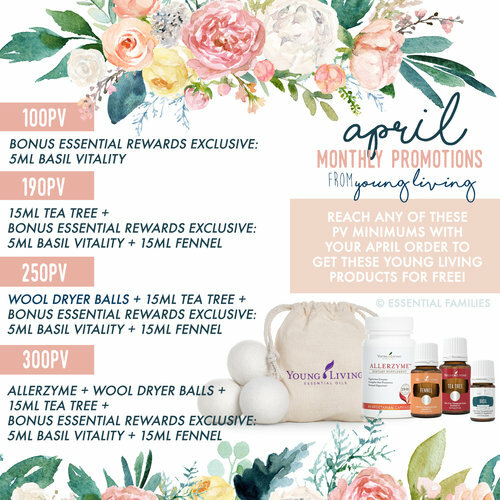 Reduce the allergens in your home and body this April! Ditch and switch the toxins in the laundry room, and support your digestive system with these bonuses. Through the Essential Rewards program, Young Living is making it so easy to breathe freely in the most uplifting, toxin-free way possible! Basil is a delicious herb used extensively in Mediterranean and Asian cuisine. Just one drop in an Italian sauce or a lemon vinaigrette adds fresh and powerful flavor. I add a single drop to a quart of lemonade! Super summery and fancy-tasting. Topically, Basil is soothing to muscles and any areas that are "cramped". Apply with carrier oil to temples, massage into shoulders, or anywhere there's a need. It's a key ingredient in M-Grain, and Oola Fitness. 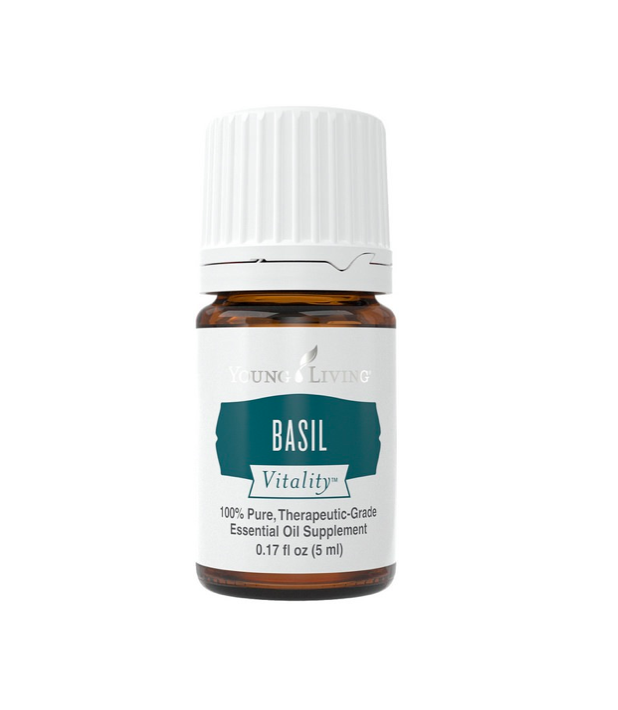 The scent of Basil is clarifying, and as a key component of Clarity, it is wonderful for alleviating mental fatigue. Diffusing Basil and breathing deeply may alleviate various nasal/respiratory situations. It also is wonderful for keeping insects at bay, and when applied topically to any bug bites, whether mild or severe! Diffuse it with Lemon to purify the air. Clean your makeup brushes, spray on your houseplants, dab on skin issues or problematic toenails, add it to shampoo for scalp-support, apply to bug bites, make a DIY face toner, dab on cuts and scrapes...there's no end to the solutions that Tea Tree provides! It's a must-have for your bathroom cabinet. -Fennel is the all-around digestive aid! It's a key ingredient in DiGize, AromaEase, and even the kids' blend TummyGize...and for good reason! This is an essential-essential for all things stomach-related. Staying healthy and avoiding sensitivities, whether airborne or food-related, starts with our gut. Better gut, better health - guaranteed! Besides the digestive system, Fennel is miraculous in the realms of hormonal balance. Nursing moms who need lots of help producing enough milk swear by this stuff! Fennel is one of the magic ingredients in the monthly cycle relief/hormone support blend called Dragon Time, and is in the hormone-balancing blends (for men and women) Mister and Sclaressence. Have you heard of these? They're becoming quite the trend! No need for highly toxic dryer sheets or fabric softener (both of which receive ratings of D's and F's by the EWG - click to see the database). These wool balls are perfect for softening your laundry while adding the fresh scent of pure essential oils. Just drop 2-3 drops of your freshest smelling essential oils onto the dryer balls, and add to the dryer. *Tip*: To reduce static, cover one ball in foil or attach a few safety pins! This is an awesome digestive enzyme supplement that should be taken before your biggest meals of the day. Especially ones containing gluten, beans, fat, or protein. The average American suffers from bloating, stubborn weight, irritation in the lining of the stomach, esophagus, or intestines, as well as food sensitivities which are all related to the lack of enzymes in our gut. Enzymes break down fats, carbohydrates, and proteins. We're SUPPOSED to get these enzymes from fresh fruit and vegetables and fermented foods, and, we're supposed to produce some on our own. But did you know that most of the food in the American diet is not only void of enzymes, but actually damages our gut's ability to produce them on our own? That's crazy!! That means we're not breaking down our food! Un-broken-down food creates severe irritation and tons of other side-effects. I LOVE the way I feel after I take these high quality enzymes with my meals, and don't want to go back to how I felt when I wasn't supporting my digestive system. Better gut, better health! While there are several Young Living enzyme supplements to choose from, Allerzyme has TONS of incredibly effective enzymes (see the ingredients here), and is infused with digestion-supporting essential oils like Fennel and other oils that are in DiGize. Get this free while you can! Watch this video on Allerzyme (and other enzyme products) by pharmacist Lindsey Elmore.